Shiloh’s Story – Virtual Ability, Inc.
My son Shiloh is nearing 30. Some nights, my son counts pumpkins. He has learned to count to four. He sometimes rides a skateboard and loves to do flips. Or, he finds chairs or benches and sits, stands, sits, stands until he has tried them all. Some nights he teaches someone the secret of how to climb his favorite tree or how to pet his reindeer. Or he shows them the colorful fish or invites them to check the tulips and thoroughly survey the rose trellises, carefully noting each color. Sometimes he changes his own outfit from a super hero to a cowboy, or back, all by himself. “I did it.”- I have succeeded at something independently and am feeling so good! “Happy.”- You’ve made me feel happy, and I want you to feel happy too. “Clik”- Hey, check this out! I can make things happen by clicking. Isn’t that amazing?! “Sit”- And the dog actually listens! “Come, please.” – And the person often follows along to learn something new. “Do not 911”- The pretend fire in Second Life is honestly not a reason to be calling the real fire department at home. “Wags”- Look, mom, this one is friendly and glad to be here! It’s wagging its tail to tell me it’s happy! With an amazing sense of direction, my son walks around Virtual Ability’s many places. He looks for and he finds people who enjoy him, and he them. Why is this so special for Shiloh and for us, his mom and dad? Shiloh is an avatar that represents our son, a young man who has Down Syndrome (trisomy 21) a genetic disorder that causes, among other things, developmental and cognitive disabilities. Our son does not speak much, or clearly, is hard of hearing, and often struggles to understand his environment, interact with it, or make his thoughts known to others outside his family. He can write his name, but that’s it. He can read and type about 70 words. He loves his job making pie boxes five days a week. He’s passionate about gardening and usually remembers not to bring the hose into the house to water the plants in the living room. He has learned to read hard words like “daffodil” or “zucchini” or “onion” even if his spellings of flowers and vegetables are often difficult to figure out. You maybe don’t think these things are a very big deal, but for Shiloh, and for us, they really are achievements that take a lot of persistence and hard work. We have been a part of Virtual Ability since 2011 when one of our relatives showed us some of the basics. Before we started in Second Life, Shiloh had not used a computer very much. Neither had we, his mom and dad, who are his “team” that partners with him any time he is in Second Life. He certainly had never been shown how to walk, sit, click, or talk to people by typing. We found Virtual Ability on our second day in Second Life and really, that made all the difference. I would have to say that the experiences we have had really caused us all to think differently about a lot of things, including about our son, and about other people. First, in Shiloh’s life, Virtual Ability is a place where he has actually made friends. People from Virtual Ability not only type to him but they actually do it because they want to, not because they have to. Sometimes people even come to where he is so he can see them to type to them. I think he then understands who is communicating. They are very patient, but they do not seem to look down on him. They encourage him to try new things and they are willing to help him learn. Mrs. Heron is always willing to type to Shiloh even if she has to do other things like go to meetings. Two of Shiloh’s friends get dressed as dogs so they can interact with him. So many of his friends in Virtual Ability show real kindness to him. Many of Shiloh’s friends even find things to do with him just because they want to share in the fun, not because they feel that they have to. This is important. Shiloh’s Virtual Ability friends are not people we, his parents, are asking to help him. They’re not people his case managers or teachers have paired him up with. They are his friends. Actual friends. Like, normal friends. Shiloh has a Virtual Ability apartment, with things in it that Sister made so he can keep learning and practicing and having fun. She helps him decorate according to his tastes, and his opinions about fish and gardens, pumpkins and reindeer are clear in the décor. In Virtual Ability, we discovered that Shiloh loves to show others how to do things, especially giving little tours of his favorite places or giving demonstrations of the things in his apartment. Until this, we never thought of our son as someone who likes to, or who could, show others or teach others things that are important to them. When we found Virtual Ability, we didn’t really understand what it was. But, now we know- Virtual Ability is a place of friendship, of learning and of belonging. If Shiloh ever has a problem with something, we can turn to his caring friends for help. When we accidently meet a “monster,” he can go to his safe place. His friends look out for him and he looks out for his friends. Our son’s skills have grown so much! He has continued to learn new words. He has figured out ways to communicate even when he does not know what words to use. 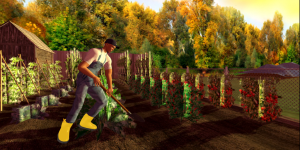 He also communicates more in his daily life because of what he has learned in Second Life. He interacts with people more than ever before, and has grown more confident in those interactions. For my husband and me, Shiloh’s parents, Virtual Ability has also made a big difference. We always chose to believe in our son’s abilities. Even when doctors or teachers told us he would never succeed at things, we always agreed to let him try, and help him try, anyway. They said he wouldn’t talk and certainly wouldn’t ever learn to read. He does. They said counting is too abstract. Now he counts to four. We never bothered to ask them if he would learn to confidently move an avatar around a world that only exists on the computer and interact with both people and objects in a virtual reality. He does, more easily than either his dad or I! When we got introduced to Second Life, we really didn’t have any idea what to do or how to do it. We, Shiloh’s parents, had to take careful notes and everything seemed so hard and a little bit scary. In some ways, Shiloh and Virtual Ability taught us how to figure things out without being afraid of making a mistake, and that asking others to help you learn things is not only okay, but is good. We learned that even if you get totally stuck in a wall or end up somehow up in outer space, all you have to do is start over again and it all works out. Those are all good lessons for life, aren’t they? The people who enjoy being with Shiloh, his friends in Virtual Ability, have also helped us as parents to remember that there is more to life success than having a job and a safe place to live. Every night after supper, Shiloh washes and dries his hands carefully and then sits himself down by the computer in our hallway near the kitchen and waits. He is as patient as he can be, but he also makes sure we remember to turn on the computer and set up Second Life! This is a good lesson for us, too. We are always very busy with juggling work and home, and dealing with the challenges and problems of life and such. It becomes easy to forget about the importance of connecting with friends and doing things together, learning things together, just for fun. Shiloh understands this, and he gently and consistently reminds us. Shiloh loves to walk around in Second Life and has learned how to do so many things. But the best thing of all is the way his eyes light up and he gets so excited when someone approaches him, when he sees another person (or a friendly animal) to interact with, and the other person types to him. He might not know what they are asking or telling him, but he knows that they are. That’s what is so valuable. If you know Shiloh, you know he often types “happy.” You probably don’t know this: he also often gently pats his computer friends on the head or softly touches their hand or arm on our finger-smudged computer screen. “Happy” is what he feels when he spends time with his Virtual Ability friends and when they spend time with him. It didn’t matter, to her, or to that other person, that Shiloh’s next comment was simply “fish.” It didn’t matter that I, helping Shiloh in the background, couldn’t remember how to change to the public from the private chatting box. It didn’t matter that Shiloh was dressed in a suit and tie and walking right into an ocean. It only really mattered that Shiloh, my son, was someone worthy of being introduced, worthy of being talked to… and was being introduced as an actual, real member of a community. I can’t say that has ever really happened for him, or for us, before. It was really a very, very powerful example of what Virtual Ability really is.